Talia’s Steakhouse now open all Saturday night! | Thanks a Glatt! « Thanks a Glatt! Giveaway: $25 gift certificate to Bagels & Co.
Talia’s Steakhouse now open all Saturday night! 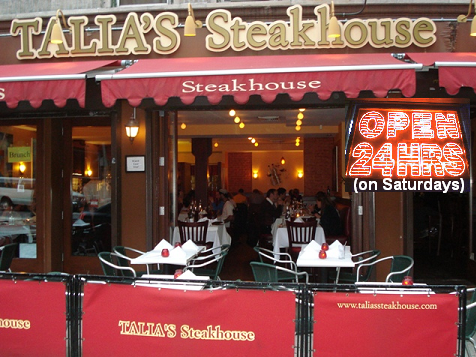 Talia’s Steakhouse, at Amsterdam Avenue and 93rd on the Upper West Side is now open all Saturday night for everyone who has been up partying learning Torah all night and needs to have a late night diet sacrifice. Do you think Talia's Steakhouse Being Open All Saturday Night is a Good Idea? Yes! There is nothing to eat 3am! I'll definately be there! I live in the area of Talia's location. I go out a lot on Saturday nights mostly to midtown area. a kebab or burger or pizza. Talia's is accommodating my needs perfectly. At least, as to the kebab and the burger. And, Talia's is doing a great job!